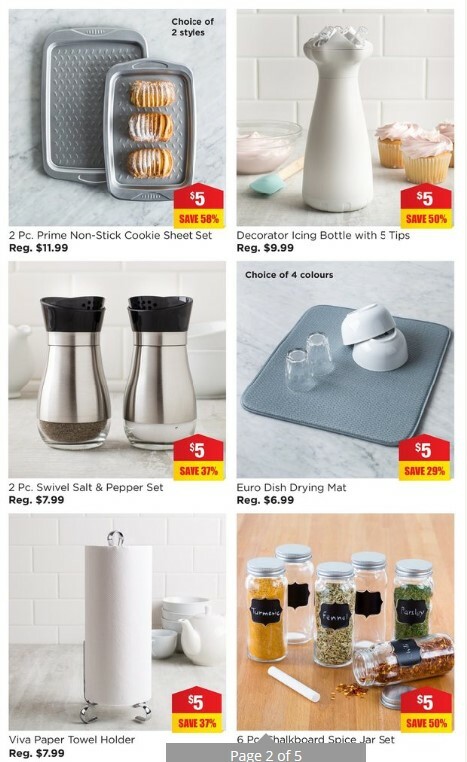 Kitchen stuff plus flyer red hot deals $5 January 15 - 21, 2018 ~ The products in this post were updated in January 15, 2018 and Only until Sunday January 21, 2018 KSP Carver Colour Coded Flexible Cutting Mat Set #68976 $9.99 Reg. 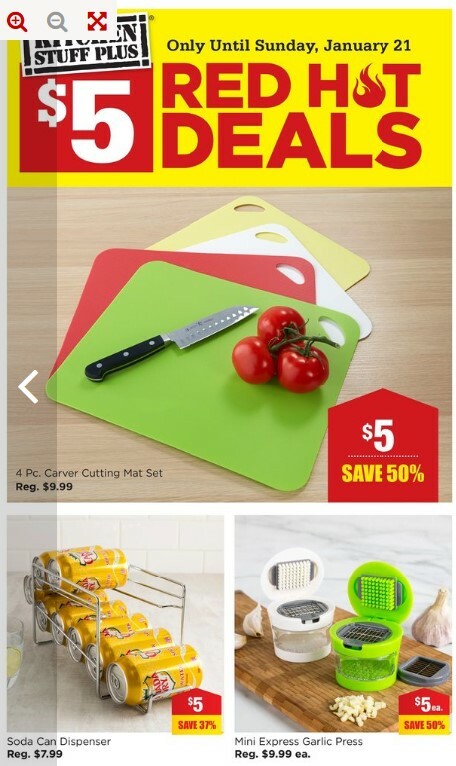 Price $5.00 Sale Price 50% Savings Our Carver Colour Coded Flexible Cutting Mats help prevent cross contamination of meat, vegetables, fish and cheese. Textured back reduces slippage while cutting and durable polythylene surface is easy to clean and won't dull your knives. Ksp Soda Can Dispenser #72412 $7.99 Reg. Price $5.00 Sale Price 37% Savings Reclaim valuable fridge space with our Soda Can Dispenser. Simple chromewire construction fits any fridge and holds up to nine cans. KSP Mini Express Garlic Press (Asstd.) #81335 $9.99 Reg. 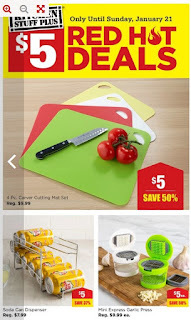 Price $5.00 Sale Price 50% Savings With one quick press, instantly slice or dice your garlic! Our Mini Express Garlic Press works in seconds and takes the work out of preparing garlic leaving your hands odour free. The clear acrylic food catcher is equipped with a grated surface, perfect for mincing your garlic. 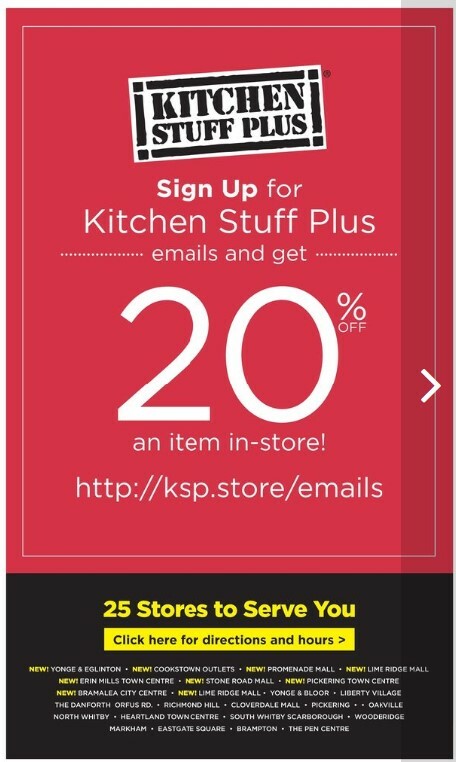 KSP Prime Non-Stick Cookie Sheet - Set of 2 #89382 $11.99 Reg. Price $5.00 Sale Price 58% Savings Bake delicious cookies or your favourite frozen snacks on these Prime Non-Stick Cookie Sheets. The 'sheet metal' texturing helps create an exceptional non-stick surface and the wide edge handles make it easy to lift and carry these pans to and from the oven. KSP Decorator Silicone Icing Bottle with 5 Tips #87878 $9.99 Reg. Price $5.00 Sale Price 50% Savings Decorate your cakes and cupcakes the easy way with our Decorator Icing Bottle. The soft, silicone bottle features 5 swivel head tips, making it easy to switch from one design to another on the fly. KSP Swivel Salt & Pepper Shaker - Set of 2 #74614 $7 Reg. Price $5.00 Sale Price Our sleek and modern Swivel Salt & Pepper Shakers are great for your kitchen or dining table. KSP Euro Microfibre Dish Drying Mat #90005 $6.99 Reg. Price $5.00 Sale Price 29% Savings Try our Euro Microfibre Dish Drying Mat (Grey) to dry your dishes and glasses with ease. This super absorbent microfibre padding protects your countertops and folds away for easy storage. 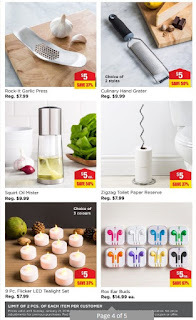 KSP Viva Paper Towel Holder #86961 $7.99 Reg. 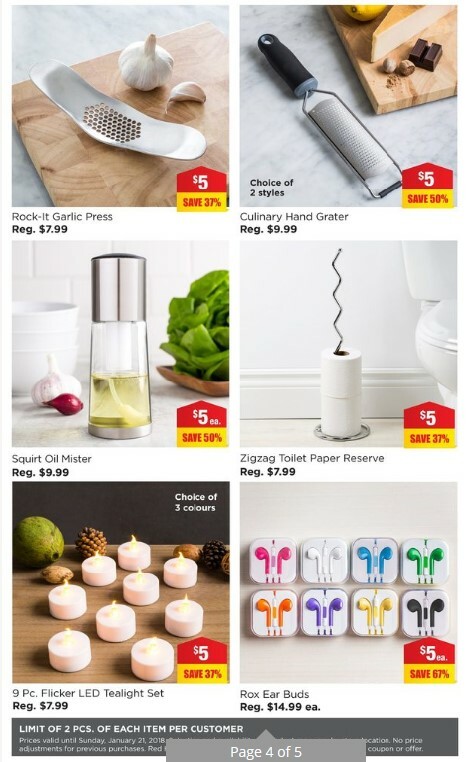 Price $5.00 Sale Price 37% Savings Store your paper towel on your countertop with the modern looking Viva Paper Towel Holder. Lightweight, chromewire construction makes it easy to place this paper towel holder wherever it's most convenient. KSP Chalkboard Glass Spice Jar - Set of 6 #84777 $9.99 Reg. 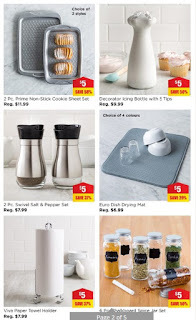 Price $5.00 Sale Price 50% Savings Easily mark what is in your spice jars with this set of glass spice jars with a chalk board space. A piece of chalk is included with this set to get your started. KSP Fresh Clip Square Storage Container - Set of 6 #90762 $9.99 Reg. 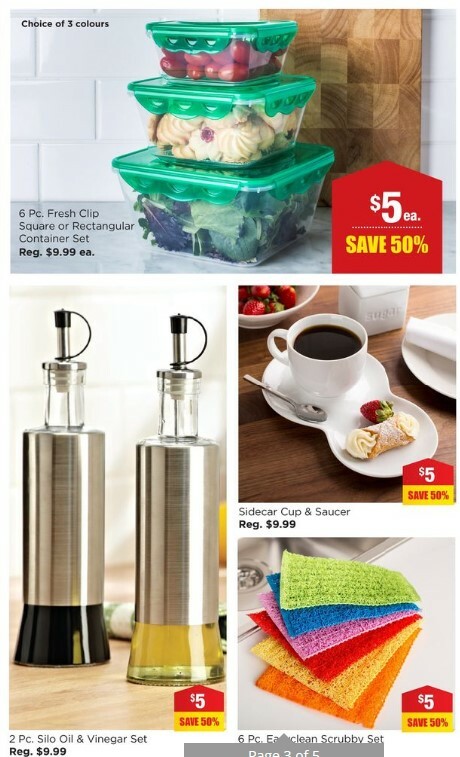 Price $5.00 Sale Price 50% Savings Store your leftover or pack your lunch in these Fresh Clip Storage Containers. With an airtight and leakproof silicone seal and clip-tight silicone lids, the containers will quickly become your favourite containers. 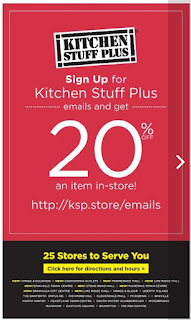 KSP Silo Flared Oil and Vinegar Set #62504 $9.99 Reg. Price $5.00 Sale Price 50% Savings The glass bottoms on this set makes it easy to identify contents and determine when it's time to refill. And the spout lets you drizzle over foods with ease. KSP Side Car Porcelain Cup & Saucer #86139 $9.99 Reg. Price $5.00 Sale Price 50% Savings Tea and biscuit? Coffee and biscotti? Our Sidecar cup and saucer is the perfect way to serve your midmorning snack. The double saucer features a space that securely holds your cup and small plate area for serving a snack or just resting your stirring spoon or teabag without making a mess. KSP Easy Clean Polyester Scrubby - Set of 6 #86259 $9.99 Reg. Price $5.00 Sale Price 50% Savings Clean up easily with these colourful scrubby pads. This set of six colourful pads are perfect for scouring hard to clean pots and pans. Durable polyester material can be used over and over again.